Which rotational system would be best to use as a model to measure how angular momentum changes when forces on the system are changed? This is College Physics Answers with Shaun Dychko. So we want to choose the best system for using as a model to see how angular momentum changes when forces on the system are changed. 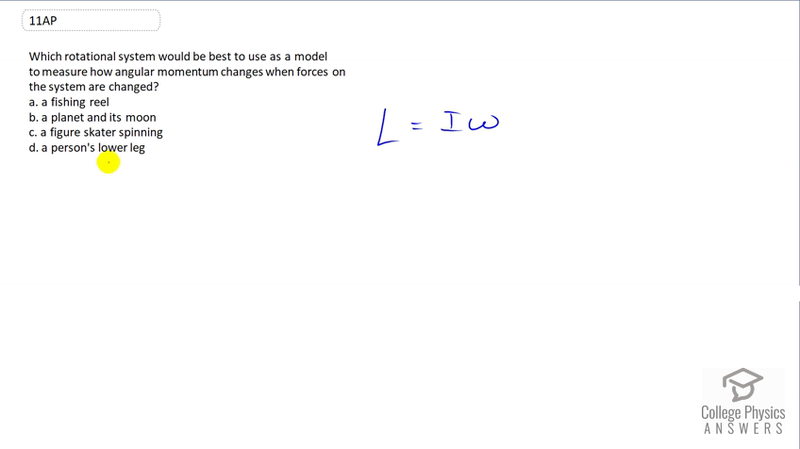 Angular momentum is moment of inertia multiplied by angular velocity so we need to have a system in which we can measure the angular velocity and we need a system in which we can change the forces on it. So the planet and the moon is not a good system because we can't change any of those forces, those things are too big. A figure skater spinning is not ideal because we can't really put a force on a figure skater. You know, he or she might fall over and also there is also a lot of scraping against the ice and so the system is not very isolated. Then part D, a person's lower leg, well, they might flex their muscle in which case they are applying a torque that's difficult to notice if you were to apply some external force to their lower leg. So that system isn't very good and so a fishing reel turns out to be our best option here because we have a little handle on the fishing reel that we can apply a force to and then notice how the rate of spinning of the fishing reel changes.